Named for the Acanthophis hawkei, a deadly Australian adder, the Thales Hawkei is a compact, light-armored, 7-ton vehicle with quick-change customizable armor and an IED blast-resistant hull. It may replace the Aussie Defense Force's aging fleet of Land Rovers. Thales has unveiled the design of its groundbreaking next generation Protected Mobility Vehicle – the Hawkei. At a time of increasing global demand for lighter protected vehicles, Thales has built on its significant experience with the Australian Bushmaster program to design this next generation vehicle. The 4x4, 6-crew, 7-tonne Hawkei provides unparalleled situational awareness, lethality and survivability for a vehicle its size. Following the tradition of the Bushmaster, which is named after a deadly pit viper, the new addition is named after a stealthy species of Death Adder – Acanthophis hawkei – which is native to Australia. "Like its exceptionally venomous namesake, this vehicle packs a punch," said Chris Jenkins, Managing Director of Thales Australia. "It is mobile, versatile, and above all well-protected. It incorporates high levels of blast and ballistic protection in a light, highly manoeuvrable and readily air transportable vehicle that has been engineered for peak performance." The new ground-breaking design meets emerging performance and capability requirements, including systems that allow the Hawkei to become a fully integrated node on the network centric battlefield. The Hawkei is designed to accommodate the future system demands of adaptive campaigning, with C4I (Command, Control, Communications, Computers and Intelligence) capabilities as fundamental part of its DNA. A systems approach to vehicle protection includes high levels of mine blast protection integrated into the Hawkei's hull design, while its adaptable ballistic protection technology is designed to be easily removed for air transportation and then refitted by a two-person crew in less than 30 minutes without using specialised equipment. This innovative design allows the Hawkei to be operated in full protection configuration that can then be reconfigured and upgraded for specific mission threats. 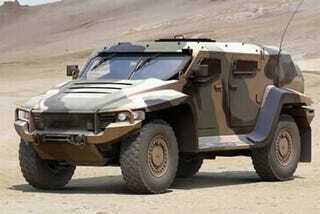 The Hawkei has been developed by Thales in Bendigo, in the state of Victoria – home of the Bushmaster. Drawing on both international and local expertise provided by Boeing, PAC Group or Plasan, and numerous Australian Small and Medium-sized Enterprises (SMEs), the vehicle's design incorporates world-leading innovative technologies. Mr Jenkins added that: "The Hawkei launch represented more than just an exciting chapter in Australia's defence capability." "The Hawkei not only meets Australian needs, but also the operational priorities of other nations. It is a next generation solution underpinned by battle proven experience from Bushmaster. We are confident the Hawkei will establish the new benchmark in Light Protected Vehicles, rendering obsolete the technology used in competing vehicles." The Hawkei is currently being submitted for the Australian Department of Defence's LAND 121 Phase 4 program, which will provide a Light Protected Vehicle to replace the Australian Army's Landrover fleet.